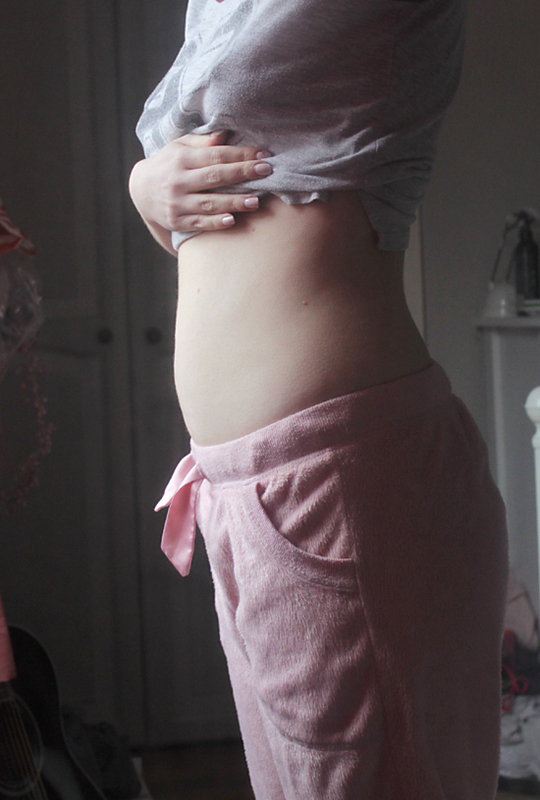 I can definitely see that the uterus is expanding, because that little poky ball under my belly button isn't normally there. Last week the baby (embryo) measured 3 mm, and because I had some more bleeding while I was away in Sweden I went in for another scan today. Everything was fine and it had grown to be 7.5 mm. Which means I was correct to assume I could be a week behind. Last week it was small for 6 weeks and this week it's big for 7 weeks. They don't generally date pregnancies this early as embryos before 12 weeks grow so differently. But I had recalculated my apps and my new due date is 31st of December. New Years! Both my children were early so now it means I'm even more likely to go into labour on Christmas! The fact that I'm still so early really hasn't made me feel any better, and to think I won't have a scan for another 5 weeks now makes me go crazy with worry. And I have one more week I have to feel like... This. What have I experienced since last updating? A few weeks ago, all I could eat was iceberg salad, but the thought of that at this point in time makes me heave. Because my nausea is at an all time high! I feel like I constantly have to vomit, but I can't. So I sit with the feeling of being really, really, hungover, all day, every day. Nothing reduces it except for peppermint chewing gums and fresh air. I am also quite tired, but if I try and do things then I don't think as much of my nausea. I am going to buy Sea band Nausea relief, acupressure bracelets and see if those help. Weight gain? No. Because it's very hard to eat anything and when I do it's small portions. I just down my water and wish for happier times!